Friends and relatives of the QCL family, welcome to another installment of the Guide Report, my first of the 2016 season. Another highly anticipated year is well underway and returning guides and guests alike are back into the mix and routine of spending day after day fishing the world class waters of Dixon Entrance. As well, guests and guides who are new to Queen Charlotte Lodge are experiencing the magic of the lodge and fishing grounds that keep many of us returning year after year. Tuesday morning featured a practically cloudless sky with the sun shining off of the Grady White fleet of fifteen. Leaving the dock in One-Fourteen with my guests after most of the fleet had already left for the early morning bite, I made a call to Fishmaster for a report as I rounded the dolphin. Cape Naden and Parker Point were the two points that seemed to have the most activity to start the day off. Wanting to wet the lines sooner rather than later I dropped in just west of Naden so I could set my gear and let the start of the day’s northwest wind drift me past the point. The Fishmaster report of fish activity was still holding true as I saw many bent rods across the collection of boats working the area. Minutes after dropping in, the first bite of the day came. 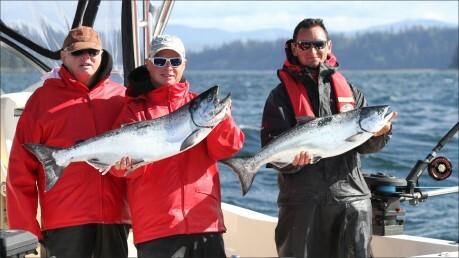 My guest Lorne set the hook and is instantly into a Chinook. Seconds later I look behind me and Lorne’s son Martin is setting the hook on the other rod. Right on boys…tough to beat a double header to start the day. A solid 20 lb Chinook was kept while the 10 pounder was released to hopefully grow into that 50-plus pounder we all hope to catch. The furious activity kept going for the next hour or two but started to taper off as the tide started to ebb hard. Action never did quite pick up again the rest of the day like it did in the morning. But every fish that was netted throughout the day kept the positivity up until the next “smiley” was hooked. Each day a couple more 30 pound-plus slabs hit the scales which always adds some extra excitement at the Bell Ringer… giving guests and guides some extra encouragement to fish the grounds hard the next day. Also a decent amount of Coho salmon were caught by the fleet today… the nice treat of a bonus Coho to take home is always welcomed. We hope to see you all up here sometime soon! Remember… keep your rods bent, line tight, and hang on for the ride! The family, friends, fun, the freezer . Good fishing trips usually have family and friends to share the experience. Catching can be big fun. If the trip ends with the full freezer anglers are usually happy.